Infloor radiant heating systems are not only the most comfortable heating systems available, but are also the smartest. We can design a heating system that is intuitive, eco-friendly, and responsive to your individual heating needs. 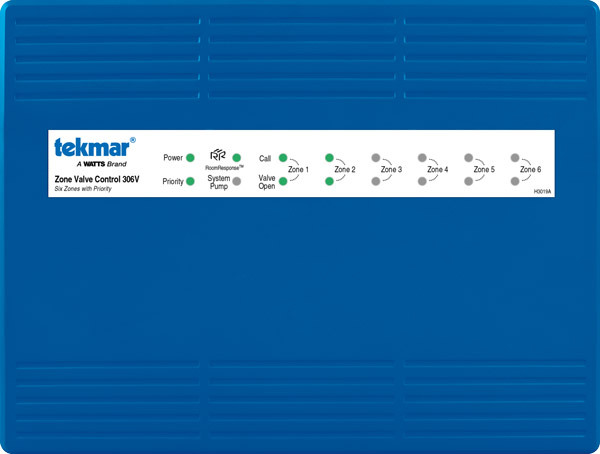 We are thrilled to have added the tekmar Zone Valve Control Box 304V and 306V to our product offerings, giving you more from your zone control solution. Live more comfortably while reducing your heating costs and carbon footprint with integrated RoomResponse™ technology, which satisfies heating needs directly at the source. And you now have the option to adjust the boiler temperature based on feedback from ANY brand of thermostat. The Zone Valve Control 304V connects up to four thermostats and operates zone valves to provide heating to a zoned hydronic heating system. The 304V operates a system pump whenever a zone valve opens. Zone 1 can operate either a zone valve or a circulator to provide heat to an indirect domestic hot water tank with optional priority over zones 2 through 4. It includes optional exercising to prevent circulator seizure when not in use, and optional post purge operation of the domestic hot water tank to maximize energy savings. The 304V provides a RoomResponse™ signal to modulating-condensing boilers to optimize comfort while improving boiler efficiency. What is RoomResponse™ and why is it beneficial (temperature & flow)? With traditional on/off flow control systems, when any zone calls for heat the boiler runs at a maximum temperature until all zones reach their thermostat setting. A high operating temperature results in temperature swings, increased cycling, and reduced efficiency. With RoomResponse, when any zone calls for heat the boiler runs at the lowest temperature required. Lower boiler temperatures reduce distribution losses while improving boiler efficiency and reducing temperature swings. Longer boiler on-times reduce cycling to increase equipment longevity. Since the system automatically adjusts the boiler based on heat demand, you never have to worry about seasonal changes to boiler curves. How does RoomResponse improve comfort & efficiency? During milder conditions and times when heat is added through indoor activity, appliance operation and solar gain, RoomResponse lowers the boiler temperature to use less energy. Boiler temperature control also enhances comfort through reduced temperature swings. Traditional systems that combine on/off control with high boiler temperatures miss out on these benefits. By factoring in how long and how often connected thermostats call for heat, RoomResponse determines if the boiler temperature is too low, too high, or ideal. This allows you to save energy with any brand of low voltage thermostat. Did you know you can Save money while on vacation? 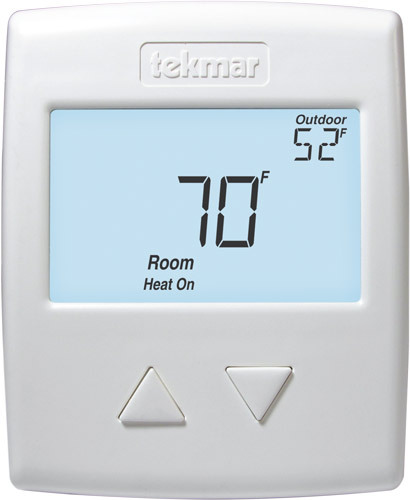 Pair zoning controls with tekmar thermostats and put the entire system into Away with one touch. 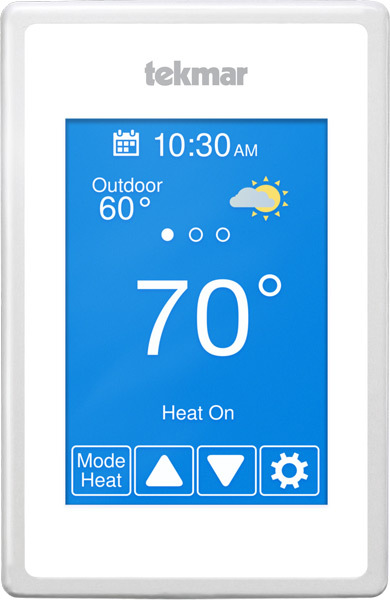 We also carry the accompanying components to make this a complete home zoning and temperature solution, including the WiFi thermostat 561 and thermostats 518 and 519. Infloor can answer any questions you have, and even design your project. We are just a call or click away. Get started today > (719)395-3400 or info@infloor.com.